The Reelout collective in 2003. Reelout’s founder, Marney McDiarmid, held test market screenings in the backroom of the city’s only gay bar, 477, to see if Kingston could sustain its own weekend-long queer film festival. As a result, McDiarmid rallied together both professionals in academia and enthusiastic film buffs and activists together to create what was known as the “reelout collective”. The group was formed around the consensus decision-making process ensuring that every member of the group had the opportunity to have a voice. 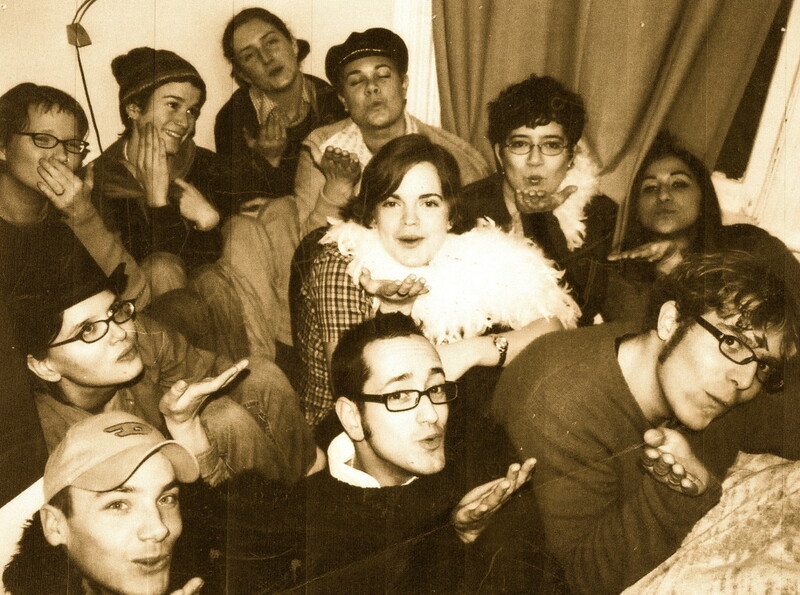 The original Reelout collective consisted of Chris Boodram, Jean Bruce, Shannon Collins, Susan Lord, Steven Maynard, Marney McDiarmid, Blake St. John,Ayse Turak, Matt Salton, Emily VanderMeulen, Carolyn Johanson, Jim Verburg, Karen Parsons, Matt Allen, Theresa James, Anna Cordner and Anne Delorme. The organizers felt they were successfully on their way to bigger and better things which included incorporating as a non-profit organization called the Reelout Arts Project Inc. in 2004. This newly formed corporation could now lay the groundwork for future sustainability and growth by forming a board of directors and hiring paid employees to direct the administrative and artistic aspects of the festival. In 2006, the festival was honoured with the Queen’s University Human Rights Initiative Award for their contribution to the community. In 2007, the Reelout Arts Project Inc. became a registered charitable organization and a member of Volunteer Canada and in 2008 established the Reelout in Schools Project specializing in diversity and gender diversity education. Over the past sixteen years Reelout has hosted an impressive guest list of film professionals who have engaged with our audiences including Daniel MacIvor, Thom Fitzgerald, John Greyson, Richard Fung,Nancy Nicol, Graham Hollings, Mike e.b, John Caffrey, Mark Kenneth Woods, Gerry Rogers, Mike Hoolboom, Peter Kingstone, Dayna McLeod, Cassandra Nicolaou,Colleen Ayoup, Duane Ghastant’ Aucoin, Bill Marchant, Jaimz Barton, Alexis Fosse Mackintosh, Maya Gallus, Alexis Mitchell, Thomas Rogers, Justine Pimlott, Scotty Berry, Chris Kennedy, Richard Bell, Ivan E. Coyote, Loree Erikson, Michele Clarke, Adam Garnet Jones, Roewan Crowe, Gwen Haworth, Jamie Travis, Charlie David, Amber Dawn, Ryan Crouchman, Jessica MacCormack, Owen Eric Wood, Ali El-Darsa, Auden Cody Neuman, Mark Pariselli, Morgan Sea, Carla Coma, Nico Stagias, Tess Vo, William Merasty, Don Bapst, Daniel McIntyre, Sonia Hong, Amy Siegel, I. Alex Abramovich, Beth Mairs, Francoise Doherty,Paul Festa, Thirza Cuthand, Sara Rotella, Adrianna DiLonardo, Myriam Fougere, Laine Zisman Newman and Roy Mitchell.